BRUSSELS, Belgium, 2017-Jul-31 — /Travel PR News/ — The Rezidor Hotel Group and prizeotel are pleased to continue delivering on their joint venture with signing of a new prizeotel in Münster-City, Germany, scheduled to open in 2020. Karim Rashid, the renowned New York-based designer and brand curator, will once again showcase his’designocrasy’ at the new prizeotel. prizeotel Münster-City is at the central inner-city location on the second front of the main railway station “Münster Hauptbahnhof” and just a short walk from the city center, congress hall, and at the gateway to the Hanseatic quarter. The area around the former city harbor is considered to be one of the liveliest of the city in North Rhine-Westphalia. A modern hotel architecture created by kadawittfeldarchitektur complements the neighborhood’s urban living. A three-building complex featuring one hotel (prizeotel) and two student accommodation facilities hosts a wide range of shops, offices and restaurants over 8,000 sqm area. prizeotel Münster-City is developed by Landmarken AG, one of the leading property developers in North Rhine-Westphalia. The hotel will have 195 rooms fit with free, high-speed Internet and straightforward mobile check-in/check-out. 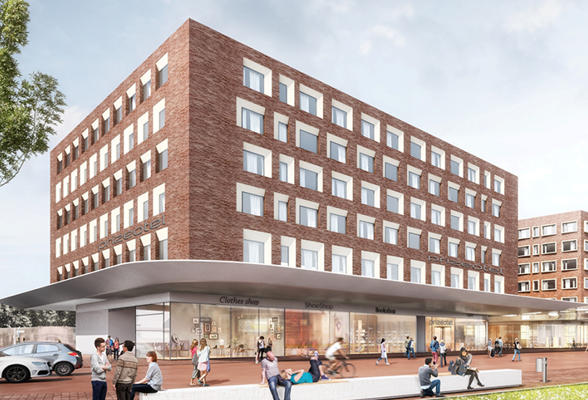 prizeotel Münster-City is the fourth hotel project realized in cooperation with The Rezidor Hotel Group, in addition to the prizeotels Erfurt-City, Bern-City and Munich-Airport, all opening in 2019. The Rezidor Hotel Group is one of the most dynamic hotel companies in the world and a member of the Carlson Rezidor Hotel Group. The group features a portfolio of 480 hotels with over 106,000 rooms in operation or under development in 80+ countries. prizeotel is an economy design hotel brand, founded in Germany in 2006 by hotelier Marco Nussbaum and real estate economist Dr. Matthias Zimmermann. For the development of its properties, prizeotel cooperates closely with New York based international designer Karim Rashid. His style is evident in all the hotels, from the layout of rooms and corridors to the lobby lounge – hence the concept of signature brand hotels. In March 2016, the Belgium-based Rezidor Hotel Group purchased a 49 percent stake in prizeotel. The medium-term aim is to establish for this most unconventional, economic design hotel chain and qualitative leader a presence in the core markets of Germany and other selected international cities. Further information is available on www.prizeotel.com. This entry was posted in Business, Hotels, Resorts, Travel, Travel Management, Travelers and tagged Elie Younes, Germany, Karim Rashid, Marco Nussbaum, Münster-City, New prizeotel. Bookmark the permalink.